Christmas is just around the corner and it is a good idea to think about how to decorate our house for the occasion. In addition to the tree and the traditional crib, there are other very special ways to decorate each space. Today we bring you some fantastic suggestions to decorate with Christmas garlands. You will love it! There are people who love Christmas. They are looking forward to this golden age and are not able to wait until December starts to take out the tree, the tinsel and the ornaments. Without belonging to this group, I also like Christmas and this year I have proposed to live with joy, squeeze every pleasant moment and be aware of all the good things that surround me. And as for the decoration of the house, I would like to try to find new formulas to create festive environments. Today we explore the thousand and one ways to decorate with Christmas garlands. You dare? Among all the decorative elements that star Christmas in domestic spaces, the garlands seem to me a resource full of advantages. Not only do they help us to create cozy and festive environments, but they are also versatile, easy to use and leave the imagination and creativity of each one free. To begin with, there is a wide variety of Christmas garland models to choose from. If before we only had the classic tinsel and little else, today we have thousands of different ideas at our disposal: vegetable garlands, rustic style , luxurious with bright, childish ornaments, etc. The Christmas of 2018, as far as decorative garlands are concerned, comes with a very marked tendency: that of betting on vegetable garlands, without flowers. Cedar, pine or spruce leaves are what we are going to see this year, putting an authentic and very natural touch to our homes. On the other hand, another point in favor of garlands is that they are quite affordable. You do not need to make a large outlay of money to give your house a very special air. 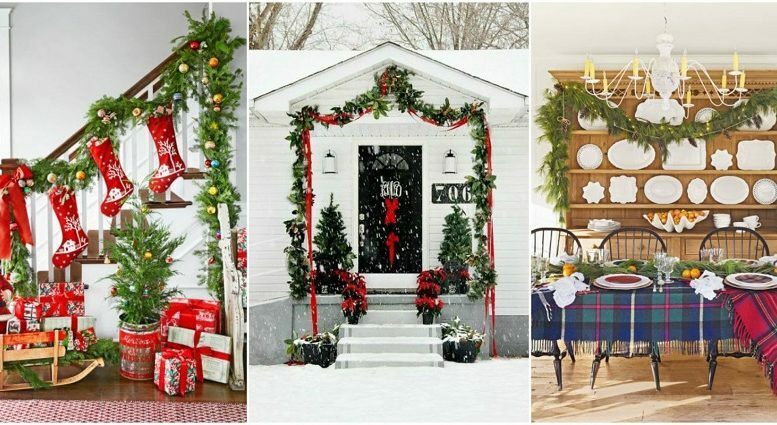 Here are 10 great ideas to fill your Christmas home with Christmas garlands. If you are lucky enough to have a living room with fireplace at home, this is one of the best places to decorate with Christmas garlands. In addition, you can do it in different ways. If you embocaduira large, opt for a leafy garland and good size, hanging to the ground (and let it drag slightly). 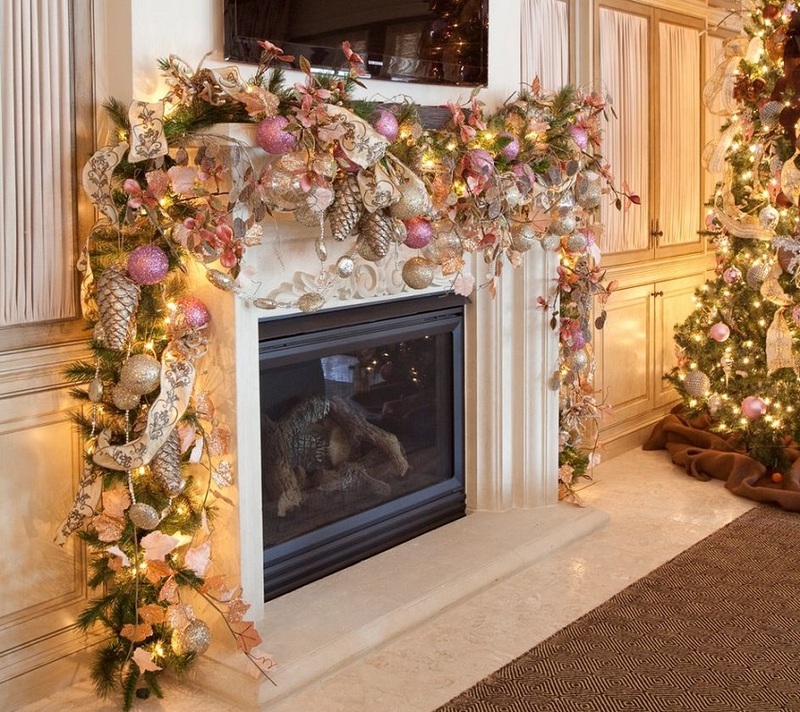 In the case that your fireplace is rather small, you can let the garland hang only halfway up the sides. Or decorate with it only the shelf. You choose. Now that open spaces are on the rise , there are many interiors featuring arches that separate two large rooms. Or smaller arcs that eliminate gates. 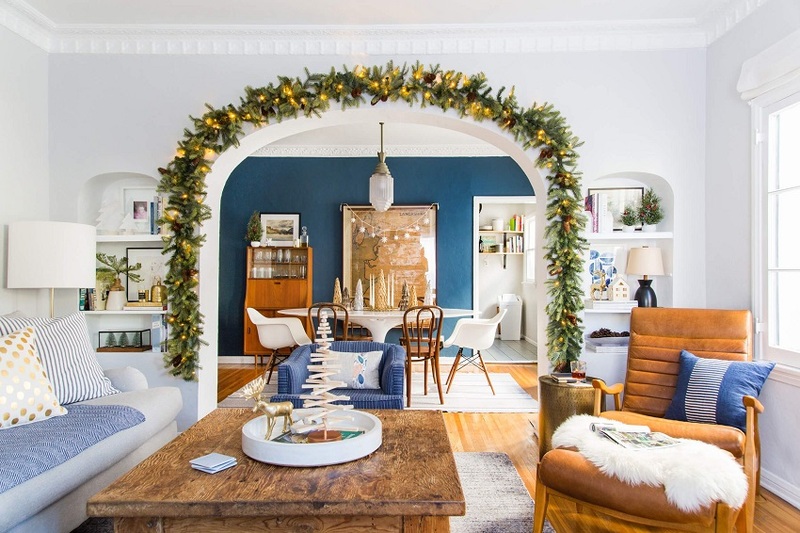 Whatever the case, at Christmas it is interesting to highlight these arches with garlands. The result is great. You can opt for simple garlands, or more complex with lights or adorned with pineapples. If you live in an apartment or a small house, you may not have a living room with a fireplace or large open spaces separated by arches. No matter. A great idea to introduce the garlands in the Christmas decoration of your home will be to frame a window with them. Choose a large window or the most prominent window in your room. And place the garland on the bar of the curtains (if you have), letting it hang to the ground by the sides. So that it does not fall, hold it with fine wire. Those who live in a two-story house should not forget the staircase, when planning the Christmas decoration. And to give it a very special touch, garlands are the ideal resource. Choose your favorite and enróscala to the handrail of the railing . You can include hanging ornaments, put garlands more or less simple. The possibilities are many. 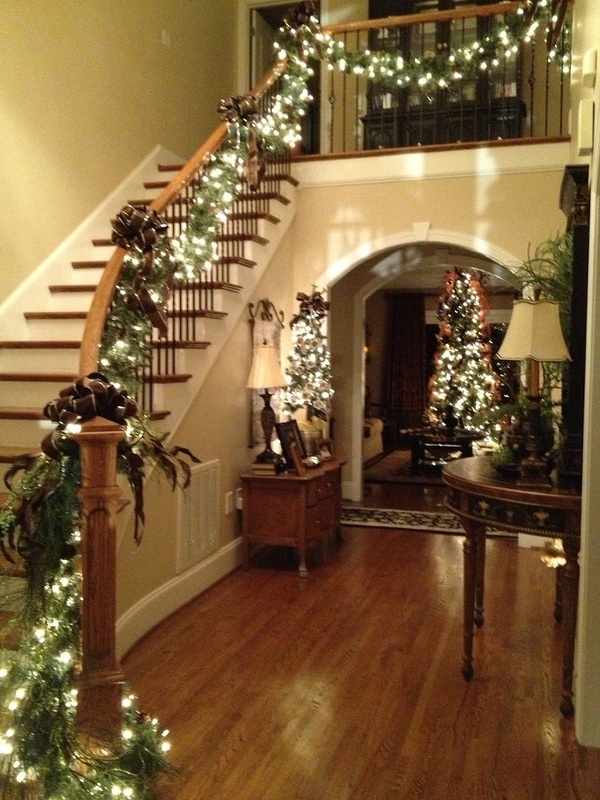 In addition, as the staircase usually starts from the same hall in many cases, decorating it with a nice garland is a way to dedicate a Christmas greeting to visitors who knock on your door. A dresser or a console are the perfect place to wear a nice Christmas wreath. As simple as that. You will not need more ornaments, just place it extended and hold it with the decorative objects that you like the most. And to give a more festive and bright air to the set, you can choose a garland with lights or include a strip of led bulbs. How about? As you can see, there are a lot of fantastic ideas to decorate the house with Christmas garlands. So many that in a next article we will bring you more, as special and original as today. Do you dare to put a garland in your house? Just one? 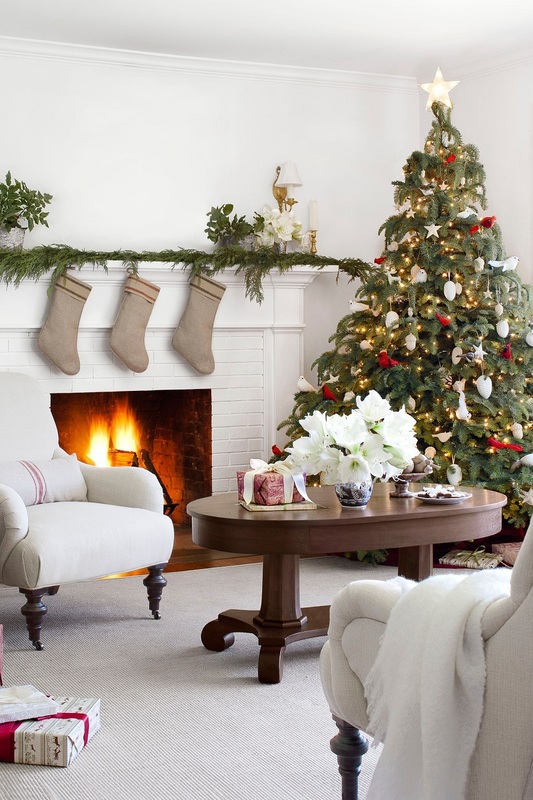 Be the first to comment on "5 great ideas to decorate your home with Christmas garlands"